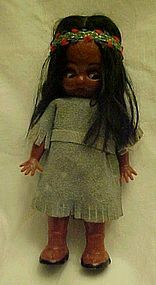 Vintage Carlson Navajo Indian girl doll. Original suede dress and head band with matching belt, and real beads. Measures 6" tall. These dolls were Handcrafted with the founders of America in mind to keep Americans aware of their heritage. Made in USA with pride. NICE condition but no tag. This is the older one made of hard plastic with moveable googly eyes. 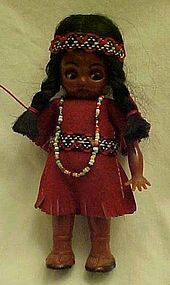 Vintage Carlson Navajo Indian girl doll. Original suede dress and head band. . Measures 6" tall. these dolls were Handcrafted with the founders of America in mind to keep Americans aware of their heritage. Made in USA with pride. NICE Average condition but no tag. This is the older one made of hard plastic with moveable googly eyes. 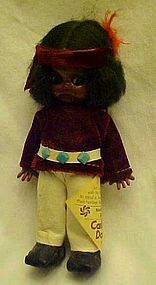 Vintage Carlson Navajo Indian Brave doll with original tag. Original clothes, leather moccasins and head band with feather. Measures 6" tall. Tag reads: A collectors item: Not a toy. Handcrafters with the founders of America in mind to keep Americans aware of their heritage. Made in USA with pride. Navajo Brave 6-13 Carlson Dolls. EXTRA NICE condition. This is the older one made of hard plastic with moveable googly eyes. 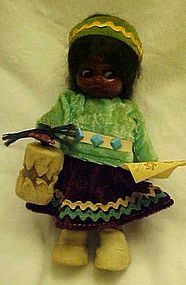 Vintage Carlson Navajo Indian Princess doll with original tag. Original clothes and drum, leather moccasins and drum cover. Measures 6" tall. Tag reads: A collectors item: Not a toy. Handcrafters with the founders of America in mind to keep Americans aware of their heritage. Made in USA with pride. Navajo Princess 6-14 Carlson Dolls. EXTRA NICE condition. This is the older one made of hard plastic with moveable googly eyes. 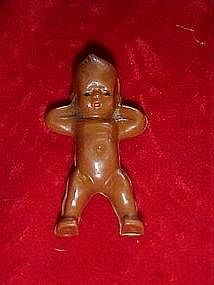 Made of hard molded plastic, in a kewpie style (no wings) He measures 2 1/4" tall. No clothes, Hands folded behind head. I have two of them. Price is for each doll.